Congratulations, Michele and David! On 9 April 2009, my dear friend Michele gave birth to a healthy baby girl, Elise (beautiful name, isn’t it?). Elise is so lucky because besides having fantastic parents, she also has two big sisters to dote on her. It’s a shaker card … with SU pink chunky sprinkles to shake in the window. I’ve always had a facsination when looking at cards with sprinkles in newsagents. Do you ever find that? Now I can’t believe I’ve made one! Need to pinch myself … LOL!! Around the outside of the card, I’ve used my new A Rose is a Rose stamp set … it’s so elegant! I’ve stamped the two step big rose in Pink Pirouette and Pretty in Pink. I love love love it!! LOL!! Don’t you just love a wedding? And when it’s your wedding, it’s one of the most memorable and special days of your life. To help add to how special my friend’s sister’s wedding day will be, my friend also asked me to make tags for “Something old, Something new, Something borrowed, Something blue” … as long as I had the time (too kind! what a fun challenge!). LOL!!! I couldn’t help but say … yes please, I’d love to have a go! What a great reason to make something special for someone on their special day!! And what an awesome idea!! 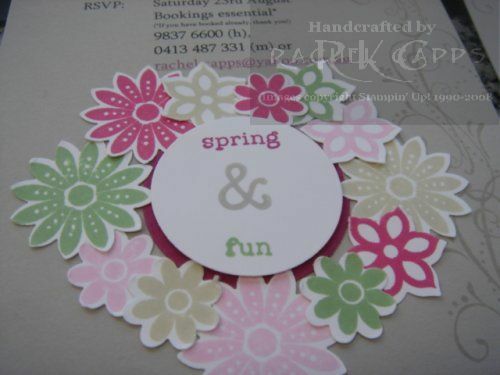 This is the tag I’ve made for “Something old” … I really tried for an old-worldy look. To do this I used the technique … emerging colour! 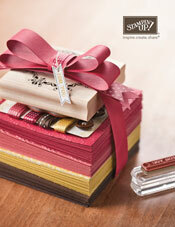 The stamp sets I’ve used for the emerging colour are En Francais, Priceless and Simply Said. 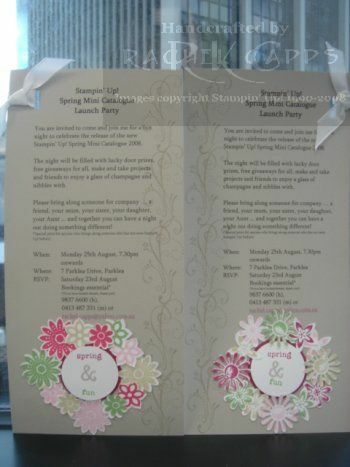 You’ll see the word “Something” from Yummy (Sale-a-bration stamp set – now unavailable) appear on every tag which I hope will unite them all too. For emerging colour I stamped En Francis in So Saffron, the butterfly from Priceless in the new In Color Kiwi Kiss and then the heart from Simply Said in versamark. Then I embossed the heart with clear embossing powder. After that, I pulled out my brayer and brayered over it all in Red Riding Hood Red. After I finished brayering, I wiped the cardstock with a tissue. I’ve distressed the edges of the emerging colour cardstock and the So Saffron cardstock. And I’ve layered them onto Kiwi Kiss. I’m sorry to say, the ribbon is either retired SU ribbon or not SU at all. Isn’t this a lovely card? It was sent to me from one of my party hostesses and I love it! I love the colour combination of Sahara Sand, Soft Sky and Purely Pomegranate. And the paper piercing and tearing effect at the bottom of the card are so clever. Trudy even used the Rock n’ Roll technique on the flower! Now I’m inspired to get out my Priceless stamp set and play with it! 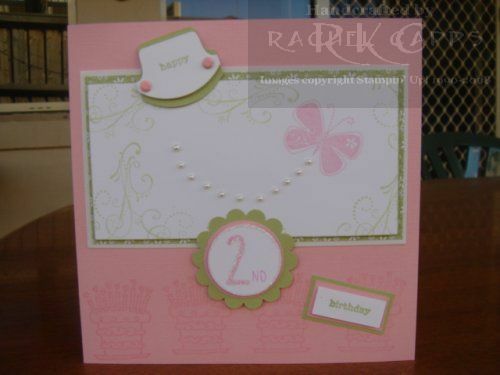 I had some fun doing this card … I played with my Large Star punch to do both masking and reverse masking! The Large Star punch made my masking a really easy task. I picked subtle colours … Soft Sky and Sahara Sand … so the photo doesn’t stand out too much, I’m sorry. It looks better in real life, especially with a dash of Dazzling Diamonds! I’ve used the stamp sets Short & Sweet and Priceless and added a little more detail with my mat pack. Enjoy! Well, here is another toddler birthday card! We have had quite a few birthdays lately 🙂 Sorry, I’m afraid we haven’t got a 6th birthday coming up … yet! I made this card a few weeks ago and forgot I had taken a photo of it! Now I’ve found the photo, I can share it with you. For this card, I’ve used the stamp sets Priceless, Everyday Flexible Phrases, Fun & Fast Notes and Best Friends Numbers for this card. I’ve forgotten how useful Everyday Flexible Phrases is! I’ve used the colours Pretty In Pink and Certainly Celery. They go so well together! And they make such a pretty birthday card for a beautiful little 2 year old girl, don’t you think? I just love textured cardstock so much !! !